Renewable energy technologies, particularly those based on wind and solar energy, are vital to meet increasing energy demands. This trifold renewables map shows where the top solar and wind installations are in the United States. 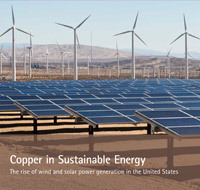 This trifold brochure covers a number of markets in which copper is an integral part of sustainable energy initiatives. Its superior electrical and thermal conductivities increase efficiency of countless energy-driven systems that rely on Electric Motors & Transformers. The same physical properties are vital in the collection, storage and distribution of energy from Solar, Wind and other Renewable sources. 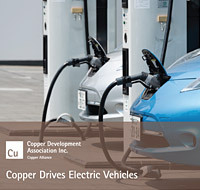 Copper is now, and will continue to be, a partner in the growth in Energy Storage batteries because its qualities of reliability, efficiency, durability and safety are fundamental to the design of properly-function. This infographic illustrates how and where copper is used in wind-energy production. This infographic illustrates the growth of solar PV in the U.S. and how and where copper is used in solar energy generation. This infograhic illustrates the growing market for energy storage in the U.S. due to governmental and venture capital investments, successful demonstration projects and recent technological advancements. 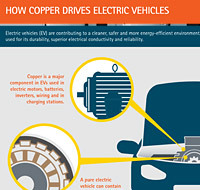 This infographic illustrates the benefits of copper in electric motors for commercial facilities and industrial plants. Motors rely on the strength and superior electrical and thermal conductivities of copper to increase productivity, be more energy efficient and reliable.